A - Appropriate for readers Ages 9 and Up. T - Teens. Appropriate for readers 13 and up. Appropriate for most readers 13 and up, parents are advised they may want to read before or with younger children. T+ - Teens and up. Appropriate for older teens. Parental Advisory - 15+ years old. Similar to T+, but featuring more mature themes and/or more graphic imagery. Recommended for teen and adult readers. What? You thought we were done with Gwen Stacy after the first two landmark series?! Get Outta Here! 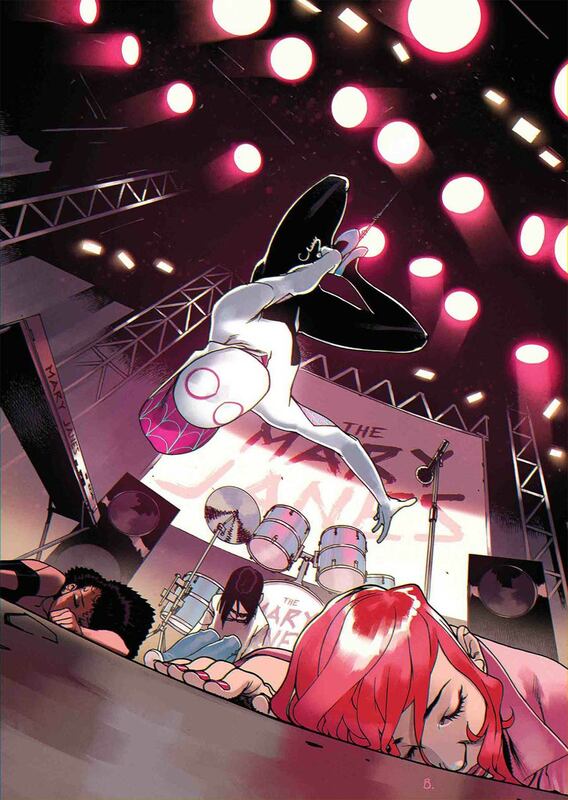 It's a whole new spin on Gwen and her world on Earth-65, brought to you by none other than Sean McGuire & Rosi Kampe! Please allow 6-8 weeks for delivery of your first issue. Get this subscription for 44% OFF! Making a dent in the criminal underworld has painted a target on Spider-Woman's back - and with her secret identity revealed, Gwen Stacy will find the people she cares about most in the crosshairs! But even if she can save her loved ones from the criminals of Earth-65, Gwen will still be a target herself!